Classic French onion soup is a favorite of many fine diners. 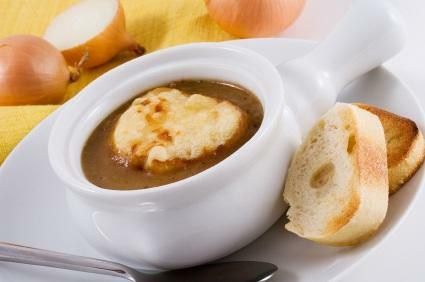 The soup, also known as onion soup au gratin, is often used as a starting course for a gourmet meal; however, classic French onion soup is hearty enough to be made into a satisfying meal all on its own. The perfect French onion soup isn't difficult to make, and it can be a delicious starter for your next gourmet meal. There are a number of elements that make up a classic French onion soup. While recipes vary, the soup always has caramelized onions, roux, and stock. Traditional onion soup is topped with cheese and served with toasted slices of baguette. The star of French onion soup is, quite naturally, the onions. There is much debate about which onions make the best French onion soup. Some prefer sweet onions like Walla Walla or Vidalia while others swear by Spanish onions or the standard yellow variety. Still others mix a variety of onions to bring out the onion flavor of the soup. If you prefer a very traditional French onion soup, stick with Spanish or yellow onions. You'll need about eight cups of onions, very thinly sliced. Heat a large flat bottomed stock pot (you will use this to make the soup as well) over medium high heat. Melt one stick of unsalted butter in the stock pot. Add the thinly sliced onions once the butter is bubbling around the edges. Stir the onions once to coat them with the butter. Spread the onions out evenly and allow them to cook for about ten minutes, stirring occasionally. After ten minutes, add a pinch of salt and give the onions a good stir. Let the onions cook for an additional 30 to 40 minutes, until they are a deep mahogany color. Stir the onions every few minutes to prevent burning and sticking and promote even caramelization. After the onions have been caramelized, you will need to add some flour to the onions and butter to thicken the soup. This is called making a roux. Continue to cook the onions over medium high heat and add three tablespoons of flour, stirring constantly. When you add the flour, sprinkle it evenly over the top of the onions. You will need to cook the flour for a few minutes to remove the raw flour taste and allow it to blend with the onions and butter. Cook the flour until it just starts to turn a light tan color. This is known as a blond roux. Once the roux is made, you can add the stock ingredients into the same pan with the onions, butter and flour. As you add the liquid, be sure that you use the edge of a wooden spoon to scrape up all of the browned bits (called fond) of onion and roux that are stuck to the bottom of the pan. This is where a great deal of flavor hides, so if you miss the step of scraping the fond, you will miss out on rich flavor. Bring the stock to a boil, and then reduce the heat. Cover the soup and simmer for about 30 to 40 minutes to allow the flavors to blend. At the 30 minute mark, taste the soup. Season the soup with up to one teaspoon of kitchen bouquet seasoning, adding a little at a time and re-tasting the soup with a clean spoon until you feel it is adequately seasoned. While the soup is simmering, toast bread to top the soup. Select a nice, crusty french bread or baguette. Slice the bread into 1/2 inch thick slices and toast them in the oven at 350 degrees for about 15 minutes to dry the bread. The classic cheese for french onion soup is Gruyère. Some cooks also use parmesan cheese or Swiss cheese. While the soup is cooking and the bread is toasting, grate the cheese to have it ready for use when you put the whole dish together. The following steps are used to make French onion soup. Add the stock ingredients and simmer to thicken and allow flavors to mix. Toast the bread while the stock simmers. Put soup in oven-proof dishes and top with a slice of bread and some grated cheese. Broil in the oven until the cheese melts and begins to brown. By using the right ingredients and preparation techniques, you can make a delicious French onion soup for your next meal.